Arapahoe Acres, built from 1949 to 1957, represents new patterns of residential development after World War II. 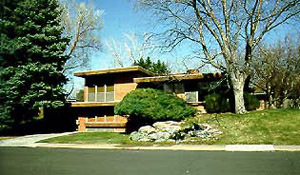 Example of Usonian style home found at Arapahoe Acres. The neighborhood forms an excellent collection of houses displaying the defining characteristics of the International and Usonian styles of architecture. Developer, designer and builder Edward Hawkins, a local pioneer in modern residential development and construction, was primarily responsible for the overall design of the neighborhood and most of the individual houses. Architects Eugene Sternberg, a regional master of mid 20th century modern architecture, and Joseph Dion, a prominent local modernist architect, also designed houses in the district.